The Rockport, Texas area and Aransas County Independent School District bore the full force and fury of Hurricane Harvey. Their buildings were battered but their spirit remains intact. Just read the update from the Superintendent below. As of today, there have been 21,556 PowerWalks completed. This means that the current donation total stands at $1,077.80. 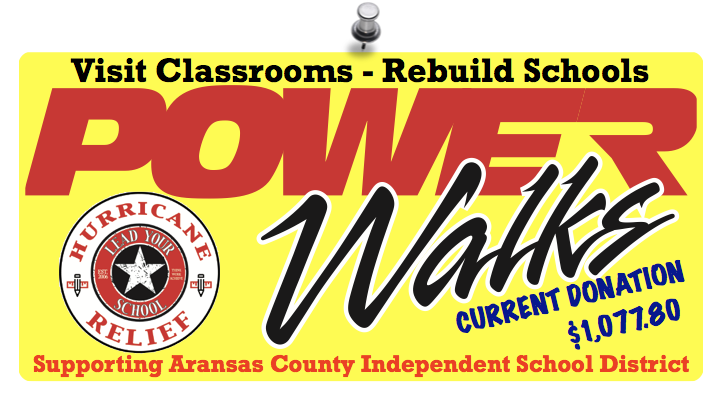 ACISD Superintendent Field Report Thank you so much for your patience as we work through the details of our recovery plan. We know that families are making critical decisions about their children’s education with very little information. We seek to only provide accurate information, and that has required great patience. We have categorized this message by topic and will continue to share applicable information as pieces unfold. After today’s meeting with North Star Recovery Company, we feel like we have a much better understanding of the necessary work required to reopen our schools. It is with great relief that we may now announce that we will begin to phase in the reopening of our schools in approximately 30 days with a possible start date of October 9, 2017. North Star is working diligently to ensure that our buildings are not only structurally safe for students and staff but that they also meet all required environmental standards for safety so that water-damaged buildings do not impose health risks. That said, the report revealed that our facilities suffered more damage than originally assumed and will require full commitment from the North Star team. Returning ACISD students and staff to their home schools is North Star’s highest priority. The high school and middle school suffered the most extensive damage and will require a minimum of 6 months to restore. Fortunately, the team has been able to secure 80 portable classrooms, which we will position on the practice soccer fields next to the bus barn. These portable building will provide classroom space for middle and high school students for the majority of the remaining school year. The three elementary schools should be ready for use in approximately 30 days as well. Fellow superintendents and I have made numerous phone calls to UIL to propose a plan that best serves our students, and UIL has devised a unique plan that suits us best. UIL will allow students displaced by Hurricane Harvey to attend other school districts during the restoration period while still competing as Rockport-Fulton Pirates. Aransas County ISD Board will approve a memorandum of understanding between the receiving districts of our displaced students and ACISD. This agreement will ensure that our students are provided the opportunity to maintain their school identity for UIL purposes while attending school elsewhere. I urge all parents to enroll children into one of these two school districts. GPISD and Sinton ISD are both quality school districts and have made significant strides to provide the very best transition for children displaced by the hurricane. The loss of 40 instructional days while waiting for our school to re-open could put these students at a significant academic disadvantage. Bus transportation will be provided by ACISD to GPISD beginning Monday, September 11, 2017. Your child must already be enrolled at GPISD to receive bus transportation. This includes all grade levels. There will be one central drop-off and pick-up location. Students in grades K-12 will load the buses at 6:30am. Buses will return to the district at 4:00pm. Visit Classrooms – Rebuild Rockport Schools!